Posted 9 June 2014 & filed under 1950s, 1960s, 1970s, Gasworks, Jennifer Taylor, Life and leisure, Oral history, Places and spaces, Pubs and clubs, Retail, Schools. Jennifer was born in the centre of St Albans, St Peter’s Street, in 1946. Her parents had a ladies fashion shop on the Peahen corner and she went to school in Holywell Hill. She now lives in De Tany Court in Sopwell. 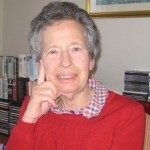 She shares her early memories of her school, the Cottonmill swimming baths, Ramsbury Road, the pig farm in Longmire Road, and the gasworks being demolished.